AVO reported on 25 November that for several weeks seismicity beneath young volcanic vents on Tanaga Island decreased significantly from levels recorded in early October. Satellite images of the island showed no anomalous temperatures or evidence of ash emissions. AVO reported that based on the decrease in earthquake counts and frequency of tremor episodes, the likelihood of an eruption had diminished. Therefore, AVO downgraded the Concern Color Code from Yellow to Green. The Alaska Volcano Observatory (AVO) detected an increase in seismic activity beneath Tanaga beginning on 1 October 2005, with 15-68 earthquakes occurring daily. Previously, less than one earthquake had occurred per month since the seismic network was installed in 2003. The earthquakes were centered roughly 2 km NE of the summit at depths of 10-20 km below sea level. The largest event was M 1.7, with most earthquakes at M 0.5-1.5. Tanaga was at Concern Color Code Green on 5 October. During 5-7 October, there was a marked increase in the rate of seismicity. The located earthquakes ranged in magnitude from 0.5 to 1.9 and ranged in depth from 6 to 12 km beneath the summit. In response, AVO raised the Concern Color Code to Yellow on 7 October. AVO reported that while the seismic activity represented a significant increase in rate, the size, depth, and character of the events were not indicative of imminent eruptive activity. Elevated seismic activity below the young vents continued through 28 October 2005, although the rate of small earthquakes decreased slightly from the previous week. The activity that began on 1 October was at the highest level recorded since the seismic network was installed in 2003, so the Concern Color Code remained at Yellow. An unusual seismic signal on 17 October that persisted for several minutes may have been a landslide or small phreatic explosion, but satellite images detected no airborne ash. Beginning on 24 October, AVO observed weak, nearly continuous volcanic tremor in the vicinity of Takawangha volcano of the Tanaga volcano cluster. This was the first recorded tremor of this type. The daily number of small earthquakes continued to diminish from its peak in early October, but stayed above background levels. 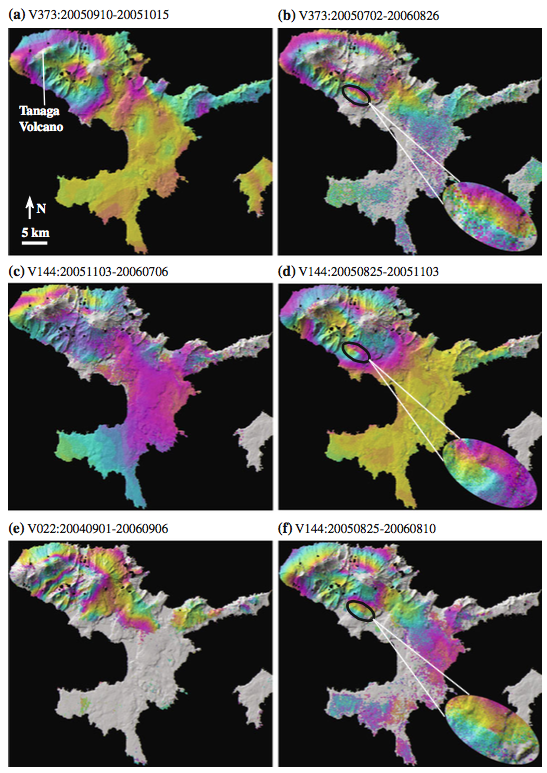 AVO reported on 25 November 2005 that for several weeks seismicity beneath young volcanic vents on Tanaga Island decreased significantly from levels recorded in early October. Satellite images showed no anomalous temperatures or evidence of ash emissions. AVO reported that, based on the decrease in earthquake counts and frequency of tremor episodes, the likelihood of an eruption had diminished. Therefore, AVO downgraded the Concern Color Code to Green. According to AVO, the most recent eruptive activity at Tanaga was a lava flow observed in 1914. Elevated seismicity below young volcanic vents on Tanaga Island continued during 21-28 October. Beginning on 24 October, AVO observed weak, nearly continuous volcanic tremor in the vicinity of Takawangha volcano of the Tanaga volcano cluster. This was the first time that tremor of this sort had been observed in the volcanic cluster since the seismic network was installed in 2003. The daily number of small earthquakes continued to diminish from its peak in early October, but stayed above background levels. Tanaga remained at Concern Color Code Yellow. Elevated seismic activity below young volcanic vents on Tanaga Island continued during 14-21 October, although the rate of small earthquakes reduced in comparison to peak values during early October. An unusual, several minute-long seismic signal on 17 October may have been a landslide or small phreatic explosion, but satellite images detected no airborne ash. The activity that began at Tanaga on 1 October was at the highest level recorded since the seismic network was installed in 2003, so the Concern Color Code remained at Yellow. Elevated seismic activity below young volcanic vents on Tanaga Island continued during 7-14 October, although the rate of small earthquakes reduced slightly in comparison to the previous week. The activity that began at Tanaga on 1 October was at the highest level recorded since the seismic network was installed in 2003, so the Concern Color Code remained at Yellow. AVO detected an increase in seismic activity beneath Tanaga beginning on 1 October, with 15-68 earthquakes occurring daily. Previously, less than one earthquake had occurred per month since the seismic network was installed in 2003. The earthquakes were centered roughly 2 km NE of the volcano's summit at depths of 10-20 km below sea level. The largest event was M 1.7, with most earthquakes between M 0.5-1.5. Tanaga was at Concern Color Code Green on 5 October. During 5-7 October, there was a marked increase in the rate of seismicity. The located earthquakes ranged in magnitude from 0.5 to 1.9 and ranged in depth from 6 to 12 km beneath the volcano's summit. In response to the observed changes in seismic activity, AVO raised the Concern Color Code to Yellow on 7 October. AVO reported that while the seismic activity represented a significant increase in rate, the size, depths and character of the events were not indicative of imminent eruptive activity. Tanaga volcano, the second largest volcanic center of the central Aleutians, is the central and highest of three youthful stratovolcanoes oriented along a roughly E-W line at the NW tip of Tanaga Island. Ridges to the east and south represent the rim of an arcuate caldera formed by collapse of an ancestral edifice during the Pleistocene. Most Holocene eruptions originated from Tanaga volcano itself, which consists of two large cones, the western of which is the highest, constructed within a caldera whose 400-m-high rim is prominent to the SE. At the westernmost end of the complex is conical Sajaka, a double cone that may be the youngest of the three volcanoes. Sajaka One volcano collapsed during the late Holocene, producing a debris avalanche that swept into the sea, after which the Sajaka Two cone was constructed within the collapse scarp. Coats R R, 1950. Volcanic activity in the Aleutian Arc. U S Geol Surv Bull, 974-B: 35-47. Coats R R, 1956. Reconnaissance geology of some western Aleutian islands, Alaska.. U S Geol Surv Bull, 1028-E: 83-100. Coombs M L, McGimsey R G, Browne B L, 2007. Preliminary volcano-hazard assessment for the Tanaga volcanic cluster, Tanaga Island, Alaska. U S Geol Surv, Sci Invest Rpt, 2007-5094: 1-35. Coombs M L, White S M, Scholl D W, 2007. Massive edifice failure at Aleutian arc volcanoes. Earth Planet Sci Lett, 256: 403-418. There is no Emissions History data available for Tanaga. 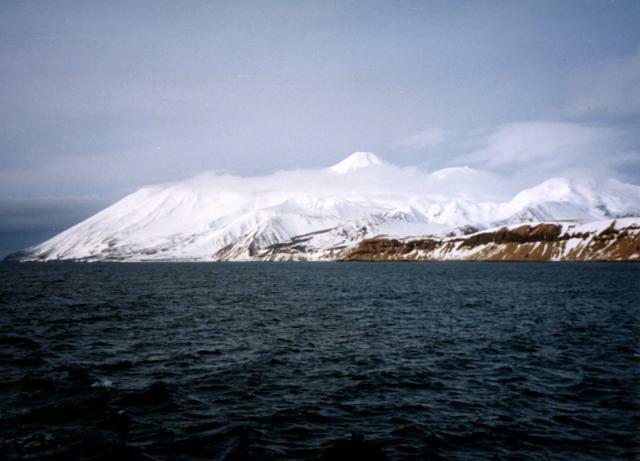 Broad Takawangha volcano (left), seen here from the east, is a 1449-m-high, youthful stratovolcano on northern Tanaga island with an ice-filled caldera. Numerous small post-caldera tephra cones are located within the caldera, as well as on its rim and flanks. The youngest cones are some of those in the caldera. No historical eruptions are known from Takawangha, in contrast to sharp-peaked Tanaga volcano (right), which occupies the NW tip of Tanaga Island. Photo by Tom Edgarton, 1986 (U.S. Fish and Wildlife Service). 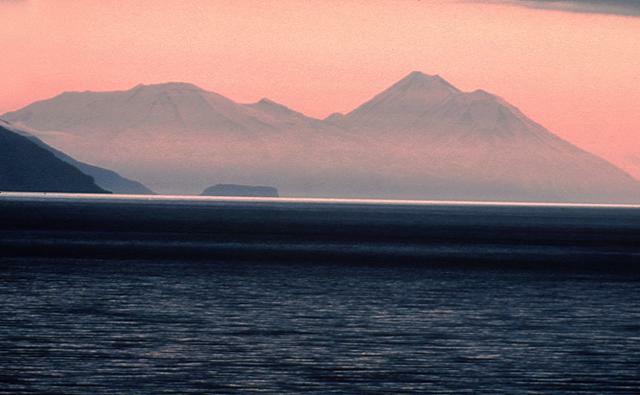 Tanaga volcano, the second largest volcanic center of the central Aleutians, is seen here from the SW with Cape Sajaka at the extreme left. The conical peak rising above the clouds (right center) is Tanaga; is the clouds to the left is Sajaka volcano. 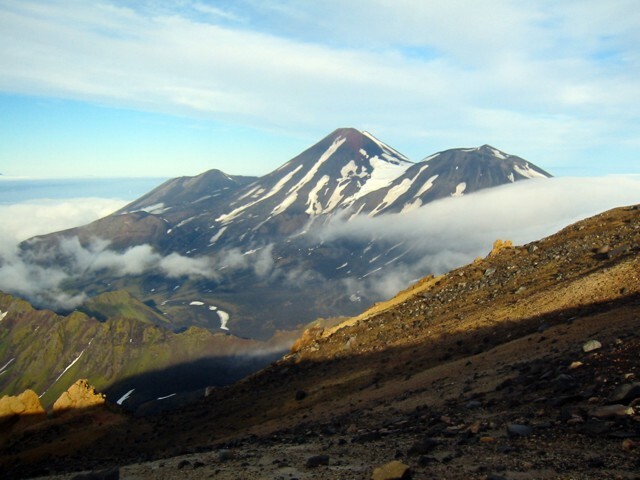 Most Holocene eruptions originated from the central peak, Tanaga volcano itself, which consists of two large cones constructed within a caldera whose 400-m-high rim is prominent to the SE. Photo by Steve Ebbert (U.S. Fish and Wildlife Service). Three peaks of the Tanaga volcanic complex, Sajaka, Tanaga, and East Tanaga (from left to right), are seen from the summit of Takawangha volcano. Tanaga volcano, the second largest volcanic center of the central Aleutians, is the central and highest of three youthful stratovolcanoes oriented along a roughly E-W line at the NW tip of Tanaga Island. The arcuate ridge at the lower left is part of the rim of an arcuate caldera formed by collapse of an ancestral Tanaga volcano during the Pleistocene. Photo by Michelle Coombs, 2003 (Alaska Volcano Observatory, U.S. Geological Survey). The following 54 samples associated with this volcano can be found in the Smithsonian's NMNH Department of Mineral Sciences collections, and may be availble for research (contact the Rock and Ore Collections Manager). Catalog number links will open a window with more information. Large Eruptions of Tanaga Information about large Quaternary eruptions (VEI >= 4) is cataloged in the Large Magnitude Explosive Volcanic Eruptions (LaMEVE) database of the Volcano Global Risk Identification and Analysis Project (VOGRIPA).